Owen seems really to enjoy people. He has a smile that draws both men and women to him and a warmth and delight that seems to make them want to forge connections with him, make him laugh. I’m never surprised when women play with him, but I’m always especially moved when men go out of their way to amuse him. Owen has made several special bonds with men, strangers, who have taken a shine to him. I’ve written about one very memorable experience in Würtzburg and recently, two more men have managed to make Owen laugh so gleefully that I felt myself thanking them and thanking them as we left. The first was our waiter at the St-Hubert Restaurant in Rivière-du-Loup. First, can I just say do they ever know what they are doing when it comes to kids… the high chair tray comes with a bib and CRACKERS! If you have a hungry child and no immediate food, you have something to feed him! Anyway, our waiter was pretty ordinary at first, but near the end of our meal, and the end of his shift, he had more time, I guess. Well, he started to make faces at Owen and hide behind his high chair. We got into a conversation about the benefits of bilingualism (his four-year-old daughter was learning both English and French, and her English was already better than his.) Language is a difficult subject in this province, so it was nice to meet someone so open to bilingualism. I told him how instinctual I had found the mother tongue. I had every intention of speaking to Owen in French when he was born but found myself unable. The songs I knew, the expressions, the baby language – all of it was English. And I imagine that French will continue to be spoken in the homes of Quebec even if more English education is provided. Then again, it always shocks me when I travel outside Quebec (or Ottawa) and realize how little French so many people know. Up with bilingualism! Anyway… I digress. Our waiter came by again while cleaning up and noticed that Owen was pretty dirty (from the meal)… so with great fanfare, he started to wash his hands (making sure to get into the cracks between the fingers) and then washed the tray – all the while making Owen laugh hysterically at his antics. Thank you Grégoire! The next day, we stopped in Quebec City to see an exhibition of Victorian paintings at the Musée National des Beaux-Arts du Québec. The exhibit was fantastic, but what was in a way even more memorable was Richard, who had been hired to assess the impact of the exhibit on Quebec tourism. He was a total clown with Owen, running behind the exhibition sign, playing peek-a-boo, and making every funny face he could think of. He was so animated and involved that he had us all laughing (Owen hardest of all). Thank you Richard! We arrived home tired and happy, in part because of the generosity of spirit of these (and other countless, nameless) strangers. Little Miss Almost There, Maybe? Because I guess I’ve always had issues with the idea of telling a child that he or she is perfect, or “the best.” Owen is my favourite boy, but he’s going to have to grow up with the knowledge that he’s fallible. And I guess I have some doubts about this philosophy, but for now, at least, I’m sticking with it. I’ve encountered too many students with an irritating sense of entitlement, who don’t believe they can do wrong. I don’t know whether their parents held them accountable for their actions or whether they were told they were perfect – maybe it’s just a personality trait – but it is not a personality trait I want to foster in my child. Owen is slowly learning to make intelligible sounds, and it’s a joy to watch him differentiate between them, but one of the things I didn’t expect was to have to correct him. He gets “Dada” right most of the time now, but his “Mama” is a cross between “Baba” and “Rararara” – so he gets a lot of “No” and a (very smiley) correction. But Owen doesn’t like to be wrong. Occasionally, after he’s been corrected, he makes a bizarre sound like a cross between a laugh and a cough, as if to cover up the fact that he made a mistake. And I certainly understand the impulse to tell him he’s done really well, even though the sound coming out of his mouth is completely wrong. And I feel silly even bringing this up, but it’s been preoccupying me lately: how to teach him (over the long run) his strengths and his limitations. If anyone has any ideas to share, I’d love to hear them. Have you ever ignored a child? A child who was grinning and waving at you? I’m not sure. I think I might have, in black days past when I was fuming at something or other and I didn’t want to be cheerful to anyone, for anyone. But I’d like to hope that I didn’t ignore a child’s beckoning glance. That I cracked a miniature smile, looked back into small, trusting eyes. 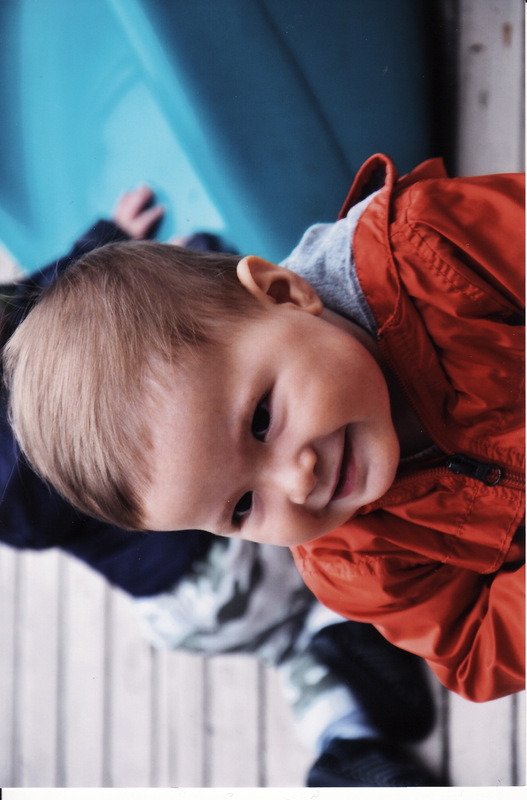 Owen is a pretty gregarious kid – he grins and waves at everyone, soliciting grins and waves back (most of the time). But it was strange and kind of sad to see one woman who, on the S-Bahn back from Bad Homburg, ignored Owen’s multiple attempts at communication. He didn’t seem fazed by it at all. It looked like he thought she mustn’t have seen him yet, so he kept trying – every five or ten minutes or so – to make her crack a smile. And she wouldn’t! For almost an hour she stared in our general direction but without a glimmer of recognition for the little boy trying so hard to make friends. She looked to be in her late twenties, was well put together, quite pretty. And I guess I keep thinking about her because I remember a time (not too long ago) when I was a little like her. When I didn’t really get kids. When I was broody and self-absorbed. My former roommate Janet used to tell me that when I was feeling miserable, the best cure was to smile. And I hated hearing that when I was moping and glowering – but of course she was right. And I think that is part of why Owen has cured so many of my bad moods – because I can’t help but smile when he’s around (especially at his latest trick, which involves pointing at Duncan or me and then applauding vigorously: “Hooray for Daddies!” or “Hooray for Mummies!” we shout). One of our favourite books lately is called Lost and Found, by Oliver Jeffers. 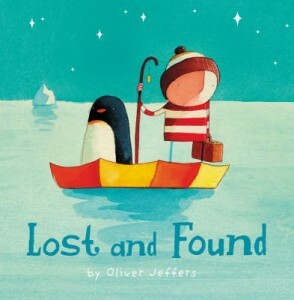 It’s about a boy who finds a penguin on his doorstep and tries to bring him “home” to the South Pole. In a way, though, it’s also a classic tale of misunderstanding, misreading, and miscommunication. When the boy is trying to figure out where the penguin comes from, he asks some birds – but they don’t answer him. “Some birds are like that,” comments the narrator. Indeed. His rubber ducky is similarly silent. 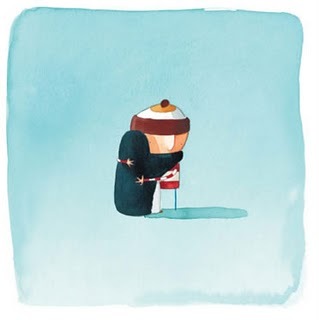 All the while, the penguin follows the boy around trying (silently) to make friends, while the boy is so intent on returning his new friend to the South Pole, that he fails to notice that the penguin just wants some attention. Isn’t that clever? The boy is a little like those birds! Fortunately, the boy realizes his mistake and the book has a happy ending. I guess all this to say that I think we all risk ignoring each others’ wants and needs, when sometimes that need is just a smile, an acknowledgment, a nod. And I hope I will never again be one of those birds – you know – the ones who are like that. Owen and I just got back from Germany, where we visited my sister Erin, her husband Nico, and their “child” Bagel the dog. It was my first solo trip with Owen, and I was quite nervous anticipating the plane ride and jet lag with a one-year-old. Well, leave it to Owen to make me want to take him anywhere, anytime. Er ist sehr freundlich! He waved and grinned his way through check-ins, security checkpoints, crowded planes, trains and streetcars. But still, I did get tired. It was new for me to be the only parent, and as much as Erin and Nico helped, I was on bath duty and bed duty and feeding duty (and the mum is generally the one to calm a fussy child… Aunts and uncles are fair-weather stand-ins). One beautiful evening, after a wonderful day meeting up with some of my friends at the zoo, Nico drove us to Würtzburg. We stopped in at the Residenz, a Baroque palace with spectacular gardens. As it happened, there was a wine festival, and since it was a lovely evening and we had to eat anyway, we decided to stay. Despite the glorious surroundings and the sunset and the cool wine and cool breezes, I was a heart-thumping stress case. There were only benches to sit at, so I couldn’t use my fantastic portable fabric high chair. I tried sitting Owen on the bench beside me, but he was topply and squirmy. Then (before I noticed what was happening), Owen started feeding Bagel some of his flammkuchen and Bagel, excited to get something to delicious to eat, snapped Owen’s fingers along with the crust, leading to tears and more maternal stress. Erin noticed that I was kind of losing it, so she took Owen across the table, and already it was better. I could see his smiley face and interact with him without being “responsible” for him. Owen started grinning and waving at our neighbour at the end of the table, a middle-aged gentleman with a very kind face who grinned back and started holding Owen’s hand and making faces. My quick-thinking sister then handed Owen over to this man, who graciously accepted the charge. He kept him entertained for about an hour, poking his finger through a hole in a wooden tray, making funny sounds and faces, and dancing (with Owen) around the jazz band that came by. His wife was also delightful; she commented that they have sons in their early twenties, but that her husband certainly looks ready for grandchildren. We separated Owen from his temporary grandpa, and I left the garden refreshed and happy. I will repeat this over and over: full-time parenting is exhausting, and it takes just little breaks to make an otherwise arduous responsibility into a real pleasure. Owen continued to make friends throughout our trip. An American man carried him (in his stroller) up several flights of stairs in 35C heat so we could reach the castle in Heidelburg. Also memorable were our neighbours on the plane ride home: a lovely Indian grandmother played with him while I filled out our customs forms, a middle-eastern gentleman played peekaboo and held Owen on his lap for about 15 minutes, and a young German woman walked Owen around the whole plane, allowing him to grin and wave at everyone as he passed them. I don’t know the names of any of these people, but thank you, thank you, thank you! Whew! You made it! You’re one. One of the most marvellous things ever to enter our lives. You shook your father and I out of our complacency, gave us another reason to try and fix the world, opened up channels of compassion and communication. You are one. One transformative little fellow. When you were born, my very first thought was Oh my God I gave birth to my father. You were hairy, really knew what you wanted, and seemed determined to get it. Then, as we introduced you to people, they all reported different resemblances: you looked like my brother Luke, Duncan’s dad Jim, Duncan’s granddad Tom, Duncan himself, and me of course. I would sit in our nursing chair upstairs and compare your fingers to mine. Your toes to mine. Your chubby legs to mine. I learned to appreciate my own legs for the first time by loving yours so much. But gradually, of course, we realized that you are none of those people. You are unmistakably yourself, a perfect mix of everyone who came before, forged into the new and wonderful bundle of Owen. You are more gregarious than either of your parents and have made us friendlier. You find joy in everything around you and your crooked grin is incredibly infectious. You have made us realize that we are better parents than we thought we would be (because you make it so easy, so fun). You have made us into a family. Thank you. I so look forward to your new words, steps, gestures, and discoveries. I can’t wait to see what the world will look like through your deep brown eyes (just like mine, only with a vision all your own). I am excited to watch you and to help you grow. When I had Owen, the one thing I was not prepared for was the fear that something bad would happen to him. I guess I knew on an intellectual level that I would love him, but I did not realize how much his limbs would become an extension of my limbs, and that I would almost feel his pain in my body (or heart?). Not quite daily, but often, I find myself terrified that something will go wrong, and when things happen that could have been worse (like he falls down two stairs and cuts his lip, or I let go of the stroller and it almost rolls off the front porch), they run through my mind for days. For example, last week I was mowing the lawn. We have a manual mower that can’t even cut through a twig (or a dandelion stem, if it’s at the wrong angle). And I had Owen standing at a bench with some toys on the other side of the lawn. He was smiling at me, and I said hi periodically, checking in with him to make sure he was OK. And I mowed that lawn! But then, for some reason, all evening long, I had visions of his limbs caught in lawnmower blades. I had to shut my brain off, but for days, this image kept creeping in. Before we had Owen, Duncan and I both had our fair share of cynicism. We didn’t understand why children were presumed to be more important than adults. We would roll our eyes at certain (fictional) shows where children were always the victims of crimes (think: CSI Miami). And the bad guys were worse guys because they did bad things to children. OK – I can still muster an eye roll at that show, but I have also become one of those people who can no longer watch bad things happen to a child. I wasn’t before. It hurts me now to see a child separated from a parent. Last night, I was reading a wonderful book (small spoiler alert if you click on the link). And when the mother’s child is taken away from her, possibly forever, I had to put the book down. I couldn’t go back to it until the next day. When I hear news reports of children who have gone missing, who have drowned, who have been hit by cars, I crumple inside. For me, having a child has opened up a connection with humanity. Owen has been an antidote to cynicism. The other day, we were out walking with Owen (in his big, fancy, expensive stroller) and a teenager came up to us to ask first for a cigarette (we don’t smoke) and then for some change (we’d left the house without our wallets). The boy could have been anywhere from 14-19. He was slight, had sores on his face, and looked like he was having a really rough time. I realized then, as I’ve acknowledged so many times since Owen was born, that we need so much from our parents, from society, and from life. Owen is so so lucky to be loved and held and laughed with. 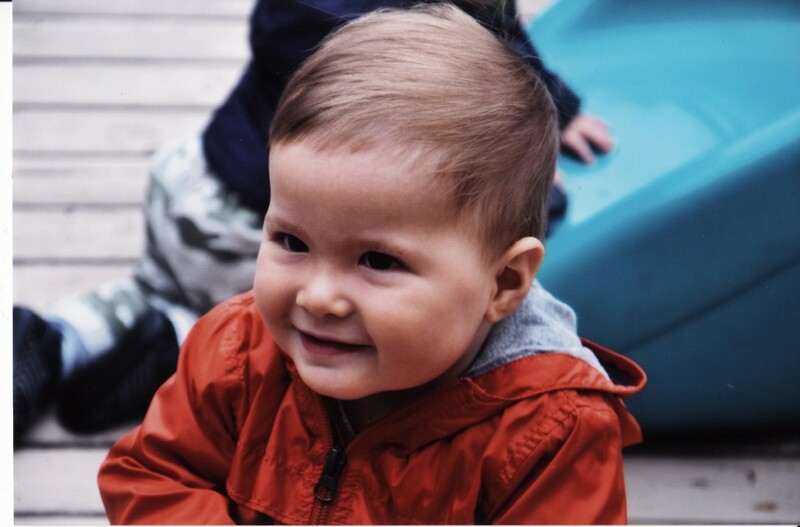 When he was just starting to smile, I remember thinking: what would happen to a baby who didn’t get a smile back? What would happen if a baby kept flashing toothless grins and no one was there to mirror those smiles? I know that people can surmount all kinds of difficulties, and I’m certainly not trying to draw any easy conclusions here. I don’t know how long our lucky streak will last. And I can’t keep Owen from hurt. Life is full of hurts, small and big. So all I can do is hug him and love him and smile back … and hope we stay lucky. I am so scared of the alternative.